Official art of the Smart Bomb as it appears in Star Fox: Assault. The Smart Bomb (スマートボム, Smart Bomb) is an item that appears in Super Smash Bros. Brawl, Super Smash Bros. 4, and Super Smash Bros. Ultimate. It is one of the most damaging thrown items in the game, with a large area-of-effect; however, it lacks in KO power. The Smart Bomb originates from the Star Fox series. It was originally named the Nova Bomb. In Star Fox 64, it could either be locked on to opponents or triggered to explode after launch by pressing the button a second time. It also would explode on impact, or after it traveled a certain distance. It did not hurt Fox or his wingmen. 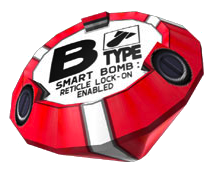 In Smash, only the "B" on the bomb is shown. Once the Smart Bomb hits an opponent, travels a certain distance, or gets attacked, it produces a slow, growing explosion that envelops a large area and damages everyone inside in increments of 1% for about three seconds, with a total damage of about 30%. The bomb does a great deal of damage but generally has the knockback to KO only around 150%. There is a small chance that a thrown Smart Bomb will fail to explode, instead making a distinctive echoing noise and traveling through its target, causing flinching but no knockback. A dud Smart Bomb will still explode when attacked and may explode at a random time, even when picked up and thrown again. In SSB4, it will not explode when held, although it may detonate almost immediately after throwing it. In Brawl, characters caught in the blast can shift their position (and possibly even escape) using Smash DI; in SSB4 this is essentially impossible due to a reduction of the Smart Bomb's SDI multiplier, they can only possibly escape by hitting the exact edge of the explosion. In Ultimate, The player who throws a Smart Bomb no longer takes damage or knockback, which might be a callback to the Star Fox games. A bomb that explodes and causes damage to all characters within its range when thrown or attacked. The explosion from this device is so large, the deployer may be caught in the blast if he or she is not careful. In Star Fox, this item will explode after a set time or can be set off immediately with a button press. The Smart Bomb trophy in Super Smash Bros. for Nintendo 3DS. The Smart Bomb trophy in Super Smash Bros. for Wii U. Attack or throw this bomb if you want to make a big impact on the battle. The explosion just grows and grows, and despite the "smart" name, this bomb will hurt the thrower too! Sometimes you may throw what turns out to be a dud, but don't go hitting it in anger—it'll still go off in your face! Artwork of a Smart Bomb. The Smart Bomb in Smash 4. Duck Hunt with a Smart Bomb in Ultimate. If one detonates a Smart Bomb on one of Snake's mines (down smash) the mine will explode rapidly until the Smart Bomb ends. The Ultimate Chimera ignores anybody caught in the Smart Bomb's explosion. While the Smart Bomb can equally harm the player who detonates it in the Smash games, it cannot harm its user or its teammates in any of the Star Fox games. This is seemingly changed in Ultimate where it doesn't harm the player who detonates the bomb, staying more faithful to the series. If too many items get caught in the Smart Bomb's explosion, it can result in a game crash. In Brawl, if a player manages to touch the Smart Bomb's explosion at the very end of it (after the "finishing hit"), they will not take any knockback and will instead go into tumbling animation. This page was last edited on November 21, 2018, at 16:17.